Recently in Stuttgart, at the LogiMAT trade fair, visitors were able to see the new truck robotics offered by the Hyster LO7.0T tow tractor. As one of the first trucks offered by Hyster Europe the truck offers Baylo developed geo-navigation technology which is able to automate logistical processes without complex infrastructure changes. So how does it work? The truck is mainly reliant on the geonavigation system for navigating the truck by the system determining the position of the truck by orienting at shelves, walls, building structures or other fixed points. There are no other physical navigation aids required. Although this technology exists within the trucks, these can still be operated manually and the automated technology switched off at any time. The software works by the geoguidance system detecting possible obstacles and the software then selecting an alternative route so the robot will be able to proceed on its journey. Otherwise, the target destination is added, and the route stored in the tow truck and after appropriate programming the robots will steer towards the target automatically. Lasers, which are located on the top of the vehicle, will scan the environment to enable the truck to move through the required area automatically. 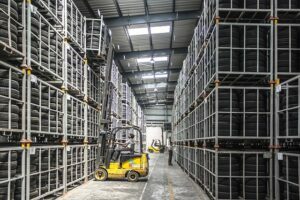 Although there is undoubtedly room for these in the industry, there is always the need for forklifts and other warehouse machinery to be operated by humans and that’s where great training is required. Forklift Agency offer health and safety approved forklift training at a time and place to suit you as an individual or employer and we don’t charge traveling costs either. The trainers are highly experienced, friendly and professional and are qualified in a range of different trucks including reach, telehandler, counterbalance and more. Why not speak to the team today about your training requirements and ask how we can help you? 0330 330 9495 or complete the form below and we’ll be in touch as soon as we can.